When it comes to commonly misused and misunderstood words it is clear that the word Capricorne takes one of the top places due in no small part to the commercial interests of wood treatment businesses. If we insert the term “capricorne insecte” into our web browser we will be inundated with results from these pest controllers and wood treatment businesses that are both misleading, often down right dishonest and only relate to one or maybe two specific species. The word Capricorne is actually applied to an entire group of beetles scientifically named Cerambycidae which are also commonly known as Longhorn beetles due to their long antennae that can with some species be considerably longer than their body. 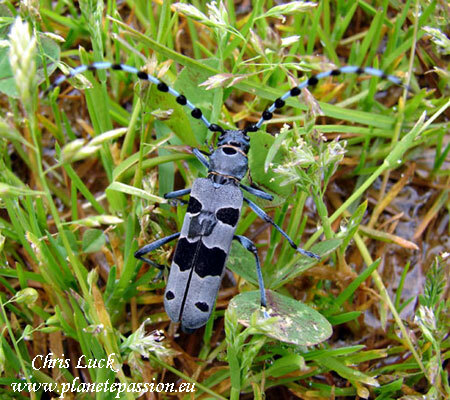 There are more than 30,000 species of Longhorn beetle in the world with an impressive 246 species listed in France two of which are protected at National and International levels and can both be found in the region of Nouvelle Aquitaine that I live in. Both are very easily identified as well as we shall see. Best to start with the only one that could potentially pose a serious threat to our buildings should they contain softwoods, Hylotrupes bajulus, or Le capricorne des maisons as it is known in French. The larvae are found uniquely in softwoods such as Maritime pine, Corsican pine, Austrian Pine, Scots Pine, Larch, Spruce and so on but never in hardwoods. The female beetle lays here eggs, normally around 30, under the bark of trees or in fissures in softwood timber used in buildings where the larvae tunnel with the grain just under the surface. Especially at risk are new constructions or pine timber houses although the initial treatment should last 10 years. The duration of larval development depends on the nutritional qualities of wood, ambient humidity, and of course the temperature which can often vary between extreme hot and extreme cold such as when used in a roof. Given these factors development larval development may require 5 to 10 years but in normal conditions it will be 3 to 5 years. Adult insects are variable in size being between 10 and 20 mm long and even up to 25 mm; females are bigger than males and they are both present from June to August with a lifespan of a week or two during which their time is devoted to breeding. An additional problem is that generations can breed within the larval galleries leading to severe infestation without discovery. Antennae are relatively short for a Longhorn beetle. They are usually quite drab in appearance, light brown to very dark brown with wing cases that have a rough aspect with stripes and spots of whitish bristles. A species that is greatly misunderstood and misrepresented is Le Grand Capricorne (Cerambyx cerdo), or Capricorne du chêne, one of the largest European Longhorn beetles measuring an impressive 24 mm to 55 mm without antennae. They are a glossy black with the ends of the wing covers a dark red or brown and as is the case with many beetles the length of the antennae can be used to differentiate between males and females. In this case the males’ antennae are greatly longer than the body; those of the female barely reach the tips of their wings. The only possible confusion for this species is with Cerambyx miles in the south of France. 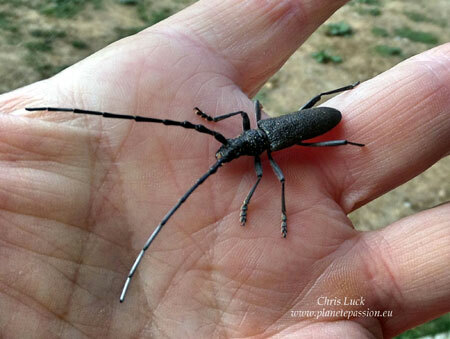 Unlike other Longhorn beetles the larvae only live in living trees and never attack dead wood. The life cycle is quite specific as follows. 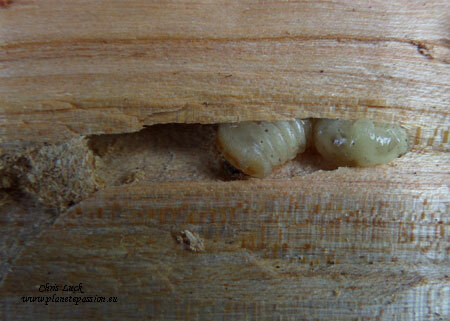 In the second year the larvae work their way deeper into the tree where they create numerous galleries. In the third year they return to being nearer the surface and at the end of summer or the beginning of autumn they create a cavity in which to pupate. Pupation lasts about 5 to 7 weeks; the emergent adult then stays in the tree until the following year when they are on the wing from June until August. The larvae, which are white, can grow to 9cm. The thorax is large with the abdomen tapering away towards the rear. Their activity can cause serious damage, often creating “dead wood” areas, but it’s important to note that they only live and develop in living trees despite what you may be lead to believe via other people. Should you have large exit holes, (up to 2cm diameter), in your oak beams they will have been there since they were installed and will not be new. They are one of the two protected Longhorn species in France and have suffered serious declines especially in the north. The other fully protected Longhorn beetle to be found in our region is the beautiful Rosalia alpina or Rosalia Longicorn, an insect to catch the eye of anyone with its pastel blue head and body with dark spots and its blue antennae with black tufts of hair on the central segments. The nominotypical taxon is blue coloured with three black spots on each elytron, (wing case), and one black spot in the middle of the anterior border of the pronotum, (plate-like structure that covers all or part of the thorax). The size of these spots varies considerably and they can be extended or reduced, partly or totally merged or may be completely absent. This enormous variability led to the description and designation of more than 100 aberrations, some very rare being all blue or almost totally black. 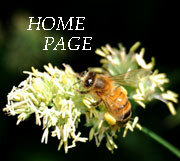 They will use numerous species of tree for egg laying and larval development. Sun-exposed dead or decaying trees, dead branches, or spots of damage in otherwise healthy trees are suitable for development and generally require braches or trunks at least 20cm in diameter. They require dry standing wood as a rule and rarely fallen trees that get wet and harbour fungi and mould. Males occupy a small territory on suitable breeding substrate and defend it against competing males in ritualised fights. After mating, the female deposits its eggs singly in bark cracks and fissures in wood, preferably in sun-exposed areas. The total number of eggs laid by the female is unknown. The larvae feed in the sapwood, mainly at the edge between sapwood and heartwood, usually avoiding the nutrient-poor heartwood. The development cycle takes three to four years, but can be completed in only two years under optimal conditions. Having covered the main species of interest and with perhaps as many as 200 species in my new enlarged region I’ll just name a few common examples that should be easily seen along with many other species by people either in their gardens or when out and about in summer. The Lesser Capricorne, Cerambyx scopolii, is a smaller version of the Grand Capricorne, Cerambyx cerdo, and is both widespread and more common than its larger cousin. Similar biology but will use most deciduous trees. 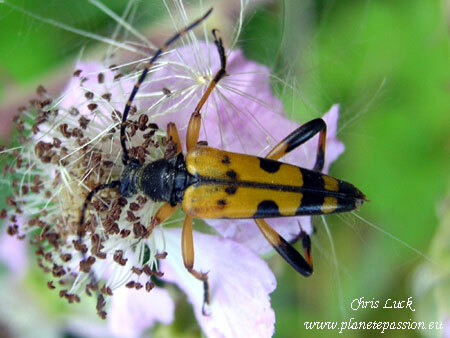 The Spotted Longhorn, Rutpela maculata, can be seen from May until August often on Umbellifers, Bramble or Mallow flowers. Up to 2cm in length the head and pronotum are dark-brown with wing cases that are yellowish, with black dots and stripes making them easy to identify. The Musk beetle, Aromia moschata, or Capricorne musqué is another beautiful species of Longhorn beetle again to be noted for its large size, 22 to 35mm and also for its bluish green colour with coppery metallic reflections. When disturbed they emit a secretion that smells of musk, hence the name. The larvae live in the wood of willows both dead and alive taking up to three years to develop. Usually in or near wetlands, marais and similar places. Stictoleptura rubra, the Red-brown Longhorn Beetle is fairly common anywhere near conifers. A small Longhorn beetle of 10 to 20mm commonly seen on flowers from June to August. 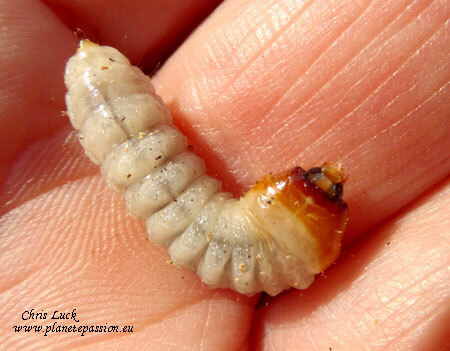 Larval development is 2 to 3 years within dead wood and tree stumps of coniferous trees. To develop and reach maturity they need nutrients provided by fungi. The larvae of all Longhorn beetles are more or less concertina shaped with a flat head and tapering to the tail and many people will have come across them when splitting firewood. Life cycle is complete metamorphosis, (egg, larva, pupa, and adult), and as with all beetles they are full size when hatched. Many are specific in the type of wood they require, others less so which gives them an edge when habitats change which happens with increasing frequency. They also mostly depend on standing dead or dying wood the value of which is often underrated. I often ring bark some trees on our land which are of no use. Essentially this means removing a band of bark to a depth of about 2 cm all round the trunk for a width of about 10 cm. This will kill the tree over a period of a few years leaving a standing dead tree for beetles and other wildlife and although the same can be done to individual branches bear in mind they will eventually drop of so not a good idea where people walk. I should also make it clear that none of these beetles is in any way harmful to people or animals.